Home » Success Stories » Let’s spread the word on safety! Let’s spread the word on safety! 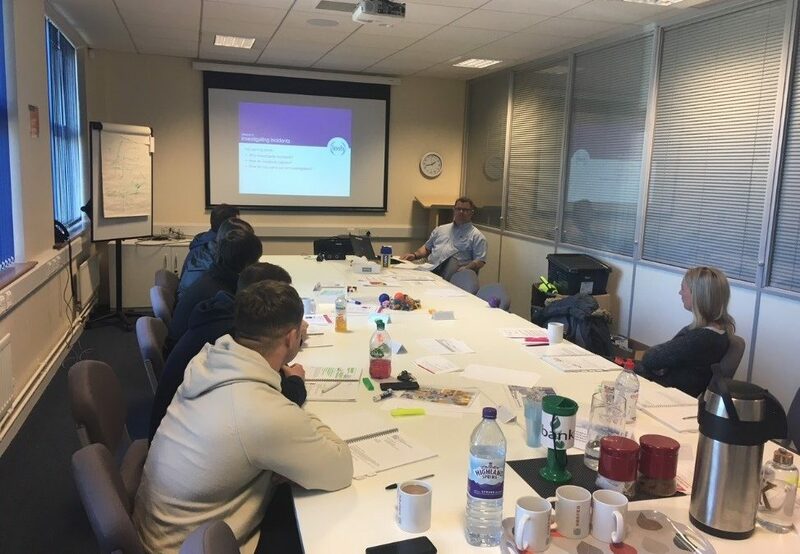 Training and development is a key element of KAEFER Ltd operations and their in-house training team regularly run Emergency First Aid at Work, IOSH Working Safely and IOSH Managing Safely courses for staff to meet their training and qualification needs. Rather than limit this development to just their own workforce, extending access to this training provision for local charities, community groups and SMEs forms a core strand of the KAEFER Cumbria Social Impact Strategy. They facilitated this access by advertising the courses on the Cumbria Exchange website and offering spare places on courses either at no cost for charities and community groups or at a subsided rate for SMEs. Since launching this initiative, over 80 participants from a diverse range of charities and community groups from across Cumbria have attended these courses – these include: the Whitehaven Harbour Youth Project, Calderwood House, Cumbria Youth Alliance, CFM Cash for Kids and the Groundwork Trust. One such participant who successfully completed the IOSH Managing Safely qualification in May 2018 was Clare France, Administrator at the Whitehaven Harbour Youth Project, after she came across the course on the Cumbria Exchange Facebook page. She has always had an interest in health and safety and was looking for courses to help develop this. Completing the IOSH Managing Safely course with KAEFER proved to be beneficial in her role at the Whitehaven Harbour Youth Project but also allowed Clare to fulfil her career ambitions. She has recently progressed into a new role within the NHS, working as a Health, Safety & Security Advisor. This demonstrates that participation in these courses enhances employment prospects and workplace skills as well as benefiting local communities by having more people with these vital skills. This initiative is one that KAEFER will continue to offer and places on upcoming courses are regularly promoted via the Exchange. By using Cumbria Exchange, KAEFER have raised the awareness of the support they can offer the community to a much wider audience throughout Cumbria so benefiting even more people. To date over 80 participants from a diverse range of charities and community groups from across Cumbria have attended health and safety related courses; supporting individual and organisational development. Unused spaces on Health and Safety related courses are offered “in kind” as development opportunities to community organisations and SMEs. Where can I find out more about the parties involved?